Brakes returned back up the Fosse Way with a vital three points from their final away game of the season to set themselves up nicely for their critical final-day clash with fellow play-off chasers Hungerford Town, writes Paul Edwards. Leamington began this tricky test with a flourish, taking the game to their hosts early on and claiming a nerve-settling lead inside the opening 15 minutes. The goal came courtesy of a composed finish from Jack Edwards, who drilled his 12th goal of the season through the legs of keeper Josh Langley after Danny Dubidat had nudged Richard Taundry’s right-wing cross into his path. Prior to this, Courtney Baker-Richardson had seen his powerful first-time drive well saved by the young goalkeeper after good work by Sam Austin down the left wing. Edwards was in the thick of the action at the other end, too, getting in a good block as James Mortimer-Jones shaped to shoot for goal. Baker-Richardson got a little too much purchase on a high ball forward, lifting it well over the bar, while Taundry did superbly to get across Ollie Knight and clear as the winger threatened to go clear on goal. Joe Halsall was inches from connecting with the ball at the far post as Baker-Richardson flicked on Connor Gudger’s cross, while the striker saw a half-volley from Dubidat’s knock-down saved by Langley. Baker-Richardson almost scored a sublime goal with his next effort, picking up the ball close to the byeline and cutting back infield before looping a cross-shot back towards goal. However, Langley was alert to the danger and held on to the ball as it arced towards the top corner. Cirencester began to get a foothold in the game before half-time, Charlie Griffin sending a free header just wide from a right-wing free-kick, while Adam Connolly’s first-time drive from the edge of the box was straight at Tony Breeden. Substitute Zak Kotwica spurned a glorious opportunity to fire the Centurions level early in the second half, sprinting through on goal only to shoot straight at Breeden, who blocked well with his legs. The home side were seeing a lot more of the ball without really causing Leamington any problems and they were made to pay for their lack of penetration with 15 minutes to go when Baker-Richardson received the ball with his back to goal on the edge of the box, turning sharply to crack a low drive into the bottom corner to give Leamington a two-goal cushion. It proved crucial as, after Griffin went close again with another header, substitute Alex Dinsmore netted in injury time for the home side, pouncing on a loose ball to fire low past Breeden. 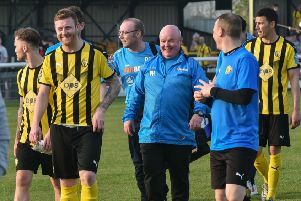 With referee Mark Russell playing a very generous amount of added time the visiting supporters were relieved to hear the final whistle sound and Twitter will no doubt be a well-used tool this week as Leamington wait to find out exactly what they need to do to secure a play-off place. Cirencester Town: Josh Langley, Anthony Brown, Aidan Bennett, Mark Pritchett, Matt Liddiard, Shayne Anson (Matt Bower, 83), Adam Connolly, James Mortimer-Jones, Charlie Griffin, Ross Langworthy (Zak Kotwica, 25), Ollie Knight. Subs not used: Alex Dinsmore, Ben Prictor, Sam Farr. Brakes: Tony Breeden, Richard Taundry, Connor Gudger (Ben George, 66), Joe Halsall, Jamie Tank, Jamie Hood, Lee Moore (Rob Elvins 76), Jack Edwards, Courtney Baker-Richardson, Daniel Dubidat (James Mace, 90), Sam Austin. Subs not used: Ben Mackey, Rob Ogleby.